Merriwa’s ‘True Blue’ Aussie event the Rosto Festival of the Fleeces, is back for the June long weekend, 9-11 June 2017. The 2017 theme ‘True Blue”, will be reflected in street decorations, the Opening Night and the Grand Parade. Chair of the Festival of the Fleeces Committee, Upper Hunter Shire Councillor Ron Campbell urged everyone to get behind the 2017 Festival. “Search your cupboards for your best blue outfit to wear for the Opening Night event at the Merriwa RSL on Friday 9 June. The night’s entertainment featuring music from party band ‘Everyday People’ and a performance from acclaimed local bush poet Tim McLoughlin is not to be missed. Book your tickets through the Merriwa VIC.” Councillor Campbell said. 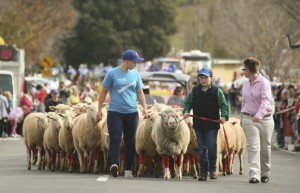 Saturday is the biggest day of the festival with all the fun of street markets and the Grand Parade led by a flock of sheep in red socks running down the main street of Merriwa. Sunday morning is the Bush Poets Breakfast where amateur and experienced tale-tellers will compete for applause and hundreds of dollars in prizes. The event will be emceed by Tim McLoughlin, a grazier from Ellerston, whose love of bush poetry came from his mother and grandmother. He recites the works of contemporary bush poets and occasionally pens a poem of his own, but his real love is the ‘Old Masters’ – Will Ogilvie, Thomas E. Spencer, C.J. Dennis, John O’Brien, Banjo Paterson and Henry Lawson. Other great attractions over the weekend include the Hanging of the Quilts at Merriwa School of Arts, team penning and the Ka-Boom fireworks finale at the Merriwa Showground on the Saturday. THIRD PRIZE: Fully packaged whole lamb, cut up by Max’s Country Cuts. Donated by The Campbell family of Merriwa and a $100 voucher for Merrifield Farm Meats. “Festival of the Fleeces is Merriwa’s biggest tourist event and I hope everyone will support it,” Cr Campbell said. “It’s a great weekend to invite friends and family to see our town at its true bluest, and don’t forget to spread the word on social media.” For more information visit www.festivalofthefleeces.com.au, like the Facebook page or follow the Festival on Instagram. Ellerston Bush poet and grazier Tim McLoughlin will perform at the Merriwa Festival of the Fleeces Opening Night and the Bush Poets Breakfast.